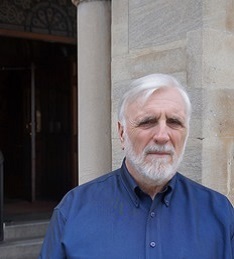 David has a wealth of industry experience having over 30 years dealing with every type of application and applicant from tourist visas for individuals to bulk applications for multinational companies and prestige sporting events giving him a depth of experience and knowledge which is almost unmatched within the industry. The company’s reputation for reliable and quality service is testament to David’s longstanding successful career. David’s principal areas of interest include business visas, partner visas, pre and post migration planning, and migration benefit management. He is primarily responsible for finance, recruitment and marketing, most recently working on re-branding project for the company. He is a regular speaker at immigration and industry events and seminars. He is also regularly asked to offer his insight by contributing to numerous articles and features for industry magazines and newspapers. Mark was one of the founding Directors of Thames Consular Services Ltd. established in the early 1980’s – the UK’s third largest visa service.Mark has a wealth of industry experience spanning over 30 years dealing with every type of application and applicant from tourist visas for individuals to bulk applications for multinational companies and prestige sporting events giving him a depth of experience and knowledge which is almost unmatched within the industry. The company’s reputation for reliable and quality service is testament to Mark’s longstanding successful career. Mark’s principal areas of interest include marketing, advertising and business development. He is primarily responsible for developing business opportunities and marketing, most recently working on re-branding project for the company. He is a regular speaker at immigration and industry events and seminars. He is also regularly asked to offer his insight by contributing to numerous articles and features for industry magazines and newspapers. Hannibal Khoury, MARA registered migration agent. Hannibal is a proud Australian citizen. He was born in Adelaide, South Australia. Hannibal is a qualified Australian Registered Migration Agent based between London and Australia with an extensive career spanning some 5 years with both Commonwealth and State Government departments including the Department of Home Affairs (DHA) in Adelaide, South Australia. Hannibal has advised a wide range of employers and employees throughout the UK and Australia together with expatriate executives based in UK, Asia, Europe, United States and the Middle East. His clients have included financial services and telecommunications executives, media professionals, and employees at the South Australian Regional Councils and ASX listed companies. 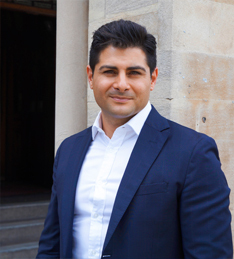 His interests are in business and skilled migration and has over 15 years experience in a diverse range of visa matters, including appeals and tribunal matters with a proven successful track record in dealing with difficult and unusual cases. Hannibal is a member of the Migration Institute of Australia (MMIA), Migration Alliance (MA) and a Registered Migration Agent with the Office of Migration Agents Registration Authority of Australia (OMARA) and subject to their Code of Conduct. He is also a member of the Britain-Australia Society. Hannibal is a Registered Agent who is a regular speaker at immigration and industry seminars and events. Deepika holds a Bachelor of Law degree from the University of Sussex, with emphasis in International Law. 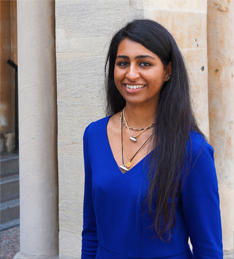 Since graduating in July 2012, Deepika went on to study the Legal Practice Course which has allowed her to develop the necessary skills to work in the legal sector. Deepika is an accredited UK immigration advisor and regulated by the Office of the Immigration Services Commission (OISC) Number 049463. She has also gained legal experience working alongside solicitors on prominent litigation cases. Deepika deals with a variety of cases, such as spouse, parent, and skilled migration visa applications. She also handles more complex and challenging cases such as 457/ 482 and employer sponsored applications, Employer Nomination Scheme, and Australian Resident Return visa applications. Deepika is fluent in Gujarati and Hindi and is also permanently based in London. Deepika is a patient, understanding and attentive Australian migration consultant who constantly receives praise from our many happy clients. Deepika is a member of the Migration Alliance (MA) of Australia. Lauren brings to Thames Migration a breath of fresh air in dealing with clients. Lauren is responsible for case support management and supporting Thames Migration across all migration and administrative functions. Lauren has recently completed her Diploma in Health and Social care and is currently working towards her qualification in Business Administration. An enthusiastic young woman who is highly dependable with strong time management skills. Lauren is a very caring individual who seeks to ensure all clients are met with a warm welcome; regardless of whether they are emigrating to Australia. Miriam is responsible for case load management and supporting Thames Migration across all business functions. Miriam is a highly motivated and organised professional with several years experience working as a PA/Administrator. She has worked successfully in high pressured situations and consistently excelled in all aspects of communication, customer service and organisation, showing particular skill for confidentiality and discretion. Miriam prides herself on her varied capabilities to deal with pressure and multi-tasking with a positive, flexible, can do attitude. A proactive team member who is always aiming to go above and beyond to ensure the best systems are in place to allow the individual and organisation to function as efficiently as possible. Miriam is working towards the development and implementation of continuous improvement and change in the London office contributing to business outcomes. Vivien has been the CEO of the Multicultural Communities Council SA (MCCSA) for over 14 years. Prior to this she was the Head of International Student Support Services at Adelaide Uni. She has been employed by Adelaide Uni for over 25 years in both teaching & administrative roles. Vivien is also a qualified lawyer and admitted to SA Supreme Court in 1996. Vivien has presented intercultural communication & cultural diversity workshops both internationally & in Australia. She is committed to the values of multiculturalism, diversity & inclusivity. Starting a new life in Australia can sometime be daunting. Drawing on her wealth of experience within the settlement and relocation offerings, Vivien removes the stress and pressure by offering a holistic approach to relocation and settlement. Covering all areas (but not limited too): Meet and greet, education and schooling, introduction to communities, and Australian employment services to name a few. Vivien has assisted a number of our valued clients in settling in Australia and positioning them for gainful employment. In 2010 Vivien received an Order of Australia Medal OAM in the Queen’s Birthday Honour List (June 2010) for her dedication & services to various communities & refugees in Australia.